Ricky Tims created this small but powerful wall quilt as a reminder that life can be challenging and that we should bend but not break. This small wall quilt can be made and given to someone as a supportive gesture or hung in your own space as a reminder to stay strong. The quilt measures 20” x 22” and features a reverse appliqué technique with satin stitch. *Please be advised that the Ricky Tims dye studios operate with a very small staff. 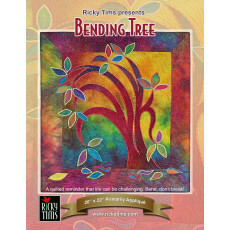 The Bending Tree kits and/or patterns are dyed and/or printed on demand on a first come first served basis. This kit is not available until ordered and then it could be 2-3 weeks before it ships.